Adam Equipment offers scales and balances that have been approved by NMI, EU, NRCS, and NTEP for use in trade. Businesses offering goods for sale by weight are required to use trade approved scales to ensure that consumers are receiving exactly what they pay for. That includes establishments that sell food and alcohol, produce, livestock feed, firewood, liquid fuel, landscaping materials, precious metals and stones, mechanical and construction parts, and pre-packaged products. Adam offers NMI approved scales in a selection of capacities, readabilities and pan sizes. Our approved bench scales can weigh and count manufactured parts for sale in tool stores or pieces of candy, spices, fruit and other food products that are to be sold by weight. 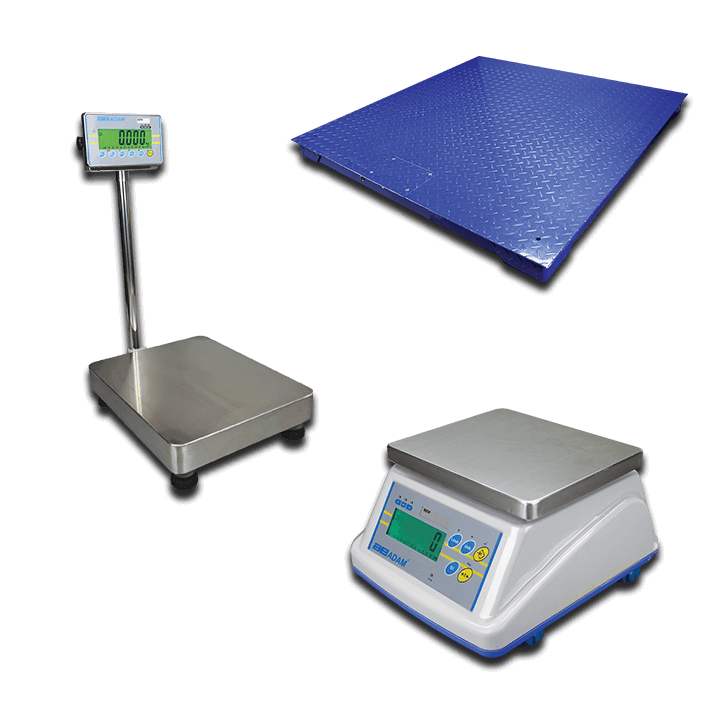 Certified checkweighing scales are designed to handle demanding weighing, batching or parts counting tasks, they ensure that a finished product sold by weight is within specified parameters. Offering high capacities and large, grade 304 stainless steel pans, Adam's floor scales are ideal for production tasks, warehouse use, and industrial operations. Businesses rely on trade approved floor scales to measure bulk goods purchased by wholesalers or packaged for delivery to retail stores. AZextra scales compute prices of retail goods sold by weight. Dual displays simultaneously show weight, price per unit, and total price to both customer and operator. With large platforms, high capacities and grade 304 stainless steel pans, GFK and GFK-M checkweighing floor scales are ideal for demanding industrial use, including food processing and manufacturing tasks. The GK checkweighing indicator features a full numeric keypad, allowing users to preset tare values for repetitive weighing of identical containers. PT industrial platform scales offer durability and quality construction suitable for withstanding rigorous industrial-grade weighing tasks in factories and warehouse environments.